The mix amongst the components making up CSL is roughly 50% computer science, 25% study of the language of choice, and 25% linguistics (holds in each of the 4 years). Below the contents of these components are briefly sketched. Refer to the menu items to the left to go to more detailed year-by-year break down. just as importantly the background theory and skills needed to produce effective software, addressed in a range of mathematics courses, in courses on data structure and algorithms, software engineering and databases. Artificial Intelligence and Computational Linguistics - the techniques involved in creating 'smart' software, especially in handling language intelligently - are emphasized throughout, and to a greater extent than in the other Trinity Computer Science programmes. The language learning component, which will be one of French, German or Irish, aims to give students sufficient competence to operate in that language in their future careers. The first two years concentrate in particular on preparing students for their 3rd year, which is spent as an Erasmus exchange student at a university abroad. 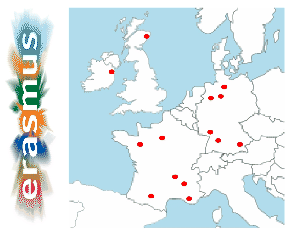 The CSL degree has an extensive network of exchange agreements with European universities that offer a similar combination of computer science and linguistics (see map for a sample), and during the year abroad education in the computer science and linguistics components continues, via the relevant language. In other years of the course too you will encounter visiting students from our exchange partners who have come to take our courses. The science of language component covers all aspects of the scientific study of language . Here, something which is familiar to everyone -- their own language -- is revealed on closer inspection to be governed by remarkably intricate structures and regularity. To some extent, anyone studying the grammar of a 2nd language has the beginnings of an insight into this, but rather than emphasizing prescriptions about what one should not write, the overwhelming concern of linguistics is with the description and explanation of what is written (or said), analyzing its structure to best predict what related things might be said, what it means, how it might be pronounced, the developmental stage at which a child might say it and so on. Phonetics, phonology and speech science are a similarly detailed study of word structure and of the relation of language to the medium of sound. These things tie together in more ways than you might think. Seeking to master a foreign language usually results in an enhanced attention to grammatical detail, and therefore a headstart in linguistics. The study of phonetics in linguistics gives valuable insight into the pronounciation of the language studied. Notions of recursion, subroutine and substructure are very much shared between computer science and linguistics. Some mathematics and software courses are shared with CS. Some language courses are shared with arts majors. Some courses in each year are just for CSL. CSL has always tended to be roughly gender balanced. CSL undergraduates will have regular contact with lecturers who are active in research in their respective subject domains. Through projects followed at a number of stages CSL undergraduates are encouraged to develop their own ideas and solutions. CSL undergraduates also attend a weekly research seminar, The Dublin Computational Linguistics Research Seminar (DCLRS), in which linguistic and computational linguistic research is presented. The DCLRS is a joint venture between TCD, UCD, DCU and DIT. Follow this link DCLRS for more information, such as the topics of recent talks. There are internship possibilities during the summer months, arising through ongoing research projects and collaborations with businesses.